What’s in a name? Everything, obviously. Especially when it’s your own name. This was particularly true for Goshen, CT redware potter Hervey Brooks (1779-1873). 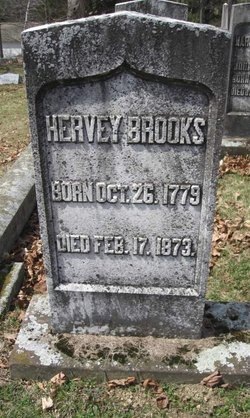 As a child, his parents referred to him as ‘Harvey.’ When his sister Clarissa moved to Missouri Territory in the 1830’s, she addressed her letters to ‘Harvey.’ When he tried to go west like Clarissa and so many others, his mom wrote to him as ‘Harvey.’ (He only got as far as Granville, NY before eventually returning to Goshen.) Back home his brother John called him ‘Harvey.’ Surviving letters in Old Sturbridge Village’s research library indicate pretty much his whole family called him ‘Harvey’ his entire life. Of course, spelling was an iffy art form in the early 19th century. Standardization came later, thanks in great part to Noah Webster. But its a fair bet to assume intention with spelling that consistent. And ‘Harvey’ isn’t such an odd name after all – if a bit rare for the time. Yet he wrote ‘Hervey’ on every document he ever signed. He presented himself to the world as "Hervey" his entire adult life. Again, consistency. Why ‘Hervey?’ One theory (supported only by the above mentioned observations) imagines him as an adolescent. Young and rearing to go. This was the era between the Revolution and the War of 1812 when the entire country was redefining itself. Creating the new out of the known. Maybe youth culture expressed itself then, as it so often does, with slang vocabulary and nick-names unique to that atmosphere. Maybe ‘Hervey’ was one such nick-name. Maybe he proudly wore it the rest of his life like an old hippy’s long hair. But none of his relatives seemed to buy into the ‘Hervey’ thing. Ever. So imagine this scenario. He died. His family had to arrange his funeral. They had to pick out a head stone. They had to instruct the mason what name to carve onto the stone. You are currently browsing the archives for the nick names category.